The deck of music repertoire playing cards that allows you to play over a dozen fun and exciting games that test, challenge and improve your knowledge of classical bassoon repertoire. 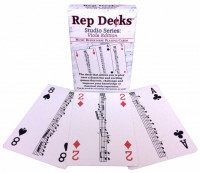 The deck of music repertoire playing cards that allows you to play over a dozen fun and exciting games that test, challenge and improve your knowledge of classical tenor and bass trombone repertoire. The deck of music repertoire playing cards that allows you to play over a dozen fun and exciting games that test, challenge and improve your knowledge of classical tuba repertoire. The deck of music repertoire playing cards that allows you to play over a dozen fun and exciting games that test, challenge and improve your knowledge of classical percussion and timpani repertoire. The deck of music repertoire playing cards that allows you to play over a dozen fun and exciting games that test, challenge and improve your knowledge of classical harp repertoire.